It was and is probably very ungenerous of me, but I got upset . . . for purely selfish reasons. “How could that beautiful band be playing there without me?” I of course realized this both vain and silly: beautiful music goes on all the time, the swing tree falling in the forest without Michael to video it, but still I felt deprived. That’s Tim, clarinet; Connie, cornet; Doug Finke, trombone; Chris Dawson, piano; Katie Cavera, rhythm guitar; Marty Eggers, string bass; Hal Smith, drums. Glorious. And don’t get upset that the song is called FAREWELL BLUES. This music isn’t saying good-bye any time soon. May I offer a six-minute escape from the world that at times weighs so heavily upon us? You know that world, defined by medical lab tests and inescapable bills, news of ungentle acts. I could wear out your eyes and sink us all into gloom describing that world. But there is another world, always alive if we can remind ourselves of it: the world of beauty and creativity, of joy and generosity. This offering of Beauty was created on April 25, 2014, at the Atlanta Jazz Party, a musical cornucopia. The exalted participants are Rebecca Kilgore, vocal; Duke Heitger, Bria Skonberg, trumpet; Bob Havens, trombone; Dan Block, tenor / clarinet; Allan Vache, clarinet; Rossano Sportiello, piano; Paul Keller, string bass; Bucky Pizzarelli, guitar; Ed Metz, drums. 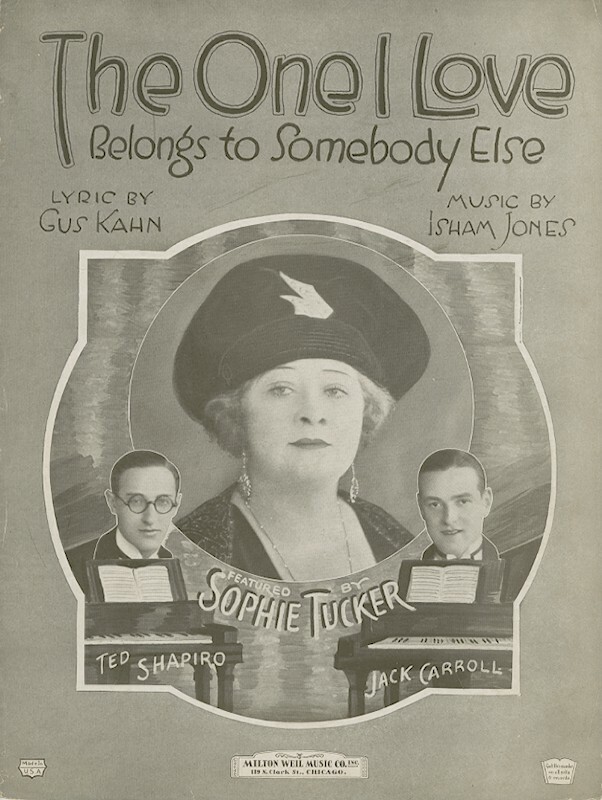 The song, ninety years old, is the Isham Jones / Gus Kahn THE ONE I LOVE (BELONGS TO SOMEBODY ELSE) — a simple melodic line built on a two-note pattern but one of those songs that takes up residence in your brain until it is chased away by external forces. THE ONE I LOVE is also a sacred favorite of mine because it plays a part in one of the great meetings of the cosmos. Earl Hines said that he was at the Chicago musicians’ union playing a new tune (yes, that one) and a cornet player introduced himself and started to play in duet with him. Yes, that cornet player. How would the course of Western Civilization have been different if Hines had been practicing scales or was standing outdoors with his cigar? I find everything about this performance endearing, from the cinema verite with which it begins (Becky offering everyone a lead sheet, facing an overexcited microphone, setting the tempo by singing the title). Maestro Sportiello enters and the rhythm section joins in: I find myself relaxing, all tension replaced by happiness, in forty-five seconds. “Safe in the arms of Joy,” I think. Listen closely, please, whether you play an instrument, sing for your supper, or are simply a devoted fan — to the beautiful singularity of the individual voices here: Becky, Bob, Bucky, Duke / Dan, and Becky returning. Each one is completely different but allied by a love for the melody and a respect for the rhythm. And PHRASING — the way Ms. Kilgore fluidly offers lines of prose and individual syllables so that the meaning of the simple lyric is enhanced, not lost, but that the words aren’t rigidly tied to the beat. Imagine the sheet music, which delineates a metronomic relationship between notes and words, and hear Becky’s intuitive elasticity, seconded by the horn soloists, elongatinf a phrase here, compressing another, emphasizing a few words and offering others with sweet conversational casualness. And even though no one is “doing repertory,” the whole performance feels as if Basie and a few of the fellows just stopped by to play one. That simple propulsive riff at the end — Basie, but reaching back to Louis. Believable, natural, uplifting music. This is high art — it takes lifetimes to know how to sing and play like this — offered without pretense. I feel better already. One could make the case that anyone can hear STARS FELL ON ALABAMA without thinking of Jack Teagarden or JEEPERS CREEPERS without recalling Louis Armstrong, but I would be somewhat skeptical. For me, the first song is ever associated with Jack — for thirty years — and with Louis at Symphony Hall in 1947; the second one has been sung and played by many people including Billie Holiday and Leo Watson, but for me it is always a Louis song — again, for thirty-five years. But I know that for most musicians, this kind of nostalgic scholarship is, at most subliminal, and these two songs are just well-established parts of the common language, songs everyone of a certain persuasion knows and loves. As do I. These performances took place on September 18, 2014, at the Thursday night jam session that is a tradition for the Allegheny Jazz Party (formerly known, in a different location, as Jazz at Chautauqua). I was sitting so close to the band, a position I favor, that it was impossible to capture everyone at once, but I think you will agree the sound and image are worth it. The band for ALABAMA was Duke Heitger, trumpet; Randy Reinhart, cornet; Bob Havens, trombone; Rossano Sportiello, piano; Howard Alden, guitar (hear his astonishing harmonics on the first song); Nicki Parrott, string bass; John Von Ohlen, drums. For JEEPERS, Harry Allen, tenor saxophone, joined in. What better advertisement for the good times and fine music to be had at the Allegheny Jazz Party? I especially admire Bob’s interplay with Frank about midway through. Don’t you wish we could have these gents playing ALWAYS? I know I do. “Meet you next year at the 2015 Allegheny Jazz Party” is what I say.